Red has long been known as a power color, but during February, red means so much more. National Wear Red Day is February 2 and I want to help each of you get decked out to show solidarity and support for Go Red for Women. So whether you you are working out or dressing up, Macy’s has multiple ways for you to GO RED this week. Looking to turn heads and transform hearts? Now through February 28, Macy’s will donate 10% of the purchase price of two dresses by Calvin Klein and Thalia Sodi to Go Red For Women®. Make every workout count. 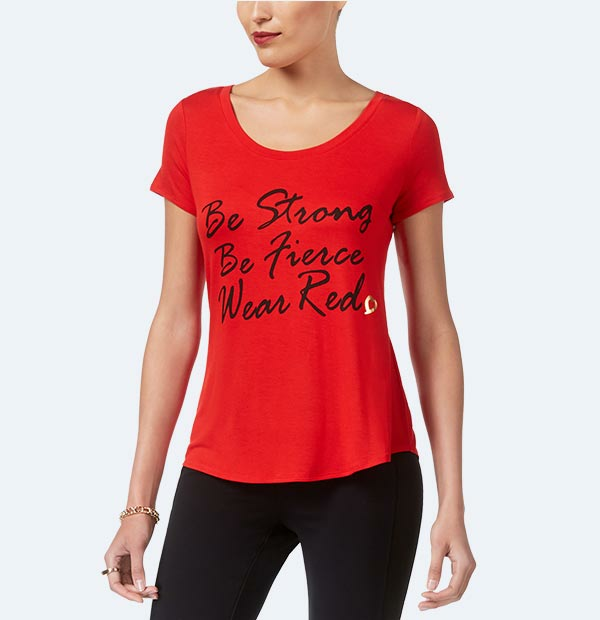 Now through February 28, Macy’s will donate 10% of the purchase price on this Thalia Sodi Go Red Metallic Graphic T-Shirt (available in sizes XS-2X) to Go Red for Women®. New York Fashion Week’s boldest show is here and red is in fashion. Watch celebs strut their stuff in designer dresses that truly make a statement—for women’s heart health. Don’t forget, you can save up to 25% off throughout Macys.com this week! Get all the discount details here.